T.Y. Lai, DCH Auto Group: "The [Pontiac] showroom was deserted. We were going to make it beautiful. We were in Toyota's backyard, and our showroom wasn't big enough. This was a golden opportunity." LOS ANGELES -- You'd have thought the two Toyota dealerships nearest to Toyota Motor Sales U.S.A. headquarters in Torrance, Calif., would be shining examples of the automaker's power and prestige. But they aren't, or at least they weren't. One was small and outdated. The other hadn't been spruced up in years and the former owners had been chastised by the state attorney general for alleged sleazy business practices. But both stores are getting major face-lifts this year. In April, Toyota of Torrance -- at the foot of the posh Palos Verdes peninsula, where many Toyota executives live -- opened a gleaming, 21,000-square-foot palace on five acres adjacent to its old showroom. And if all goes as planned, South Bay Toyota -- in Gardena, a 7-iron from Toyota's corporate offices -- will follow suit by year end. "We want to make it what Toyota wants," said Craig Whetter, executive vice president of the multifranchise David Wilson Auto Group, which owns South Bay Toyota. "It should be what you want to see when you go across the street from national headquarters." 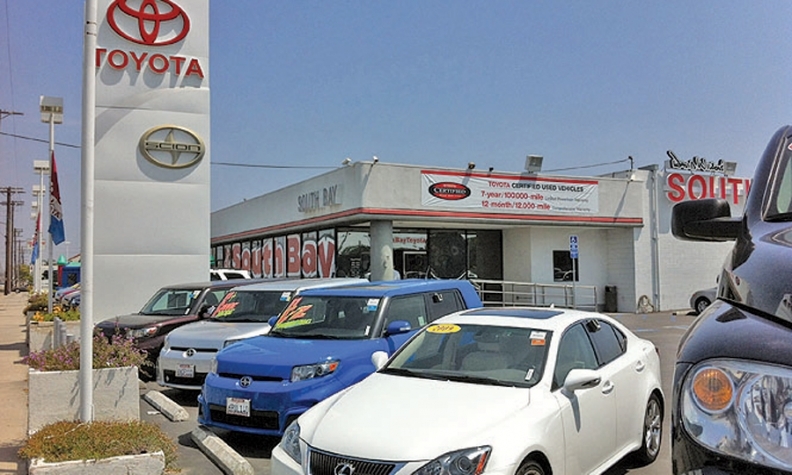 South Bay Toyota in Gardena, Calif., owned by David Wilson Auto Group, is due for a renovation by year end. Of course, extensive improvements require big investments, so it helps that the owners of Toyota of Torrance and South Bay Toyota have deep pockets. David Wilson Auto Group had $1.24 billion in 2011 revenues from 15 locations. 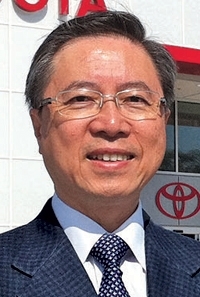 DCH Auto Group, which owns Toyota of Torrance, has 27 dealerships in four states and revenues that approach $2 billion. A lot is at stake. In the first quarter, Toyota and Scion accounted for 21.6 percent of new-vehicle sales in the Los Angeles area, according to Experian Automotive. Honda was a distant second at 14.8 percent. But Toyota and Scion's share in the region has dropped 2 percentage points in the past year, while Nissan, Hyundai and Kia have gained ground, according to Experian. Twenty-five Toyota stores, including Longo Toyota, the nation's largest dealership, are competing for buyers within 25 miles of the Torrance headquarters. Toyota of Torrance has moved next door into a Pontiac dealership that went bust. That store had been owned by General Motors, which still held the lease. "The [Pontiac] showroom was deserted," said T.Y. Lai, COO for DCH's western region. "We were going to make it beautiful. We were in Toyota's backyard, and our showroom wasn't big enough. This was a golden opportunity. "The challenge was getting GM to leave," he said. "They were almost bankrupt, so it was hard to find people to talk to." The Toyota and Pontiac stores were on the strip of land along the north side of Pacific Coast Highway, which abuts Torrance Municipal Airport. That land is owned by the city of Torrance, so Lai appealed to city officials for help getting GM to sign over the lease. After the lease was signed over, DCH began planning to renovate the store in accordance with Toyota's Image USA II facilities plan -- but with a twist. In addition to having a new showroom design, DCH met the stringent environmental-friendliness standards and received gold certification for the dealership under the U.S. Green Building Council's Leadership in Energy and Environmental Design program. The dealership's roof has a horizontal lip that keeps the Southern California sun from blasting through the dealership's windows, reducing the need for air conditioning. Skylights illuminate the showroom, cutting electricity use. Vending machines are on timers that switch off at night. Offices have motion-sensor lighting. At night, the lot is illuminated with LED lighting, which uses one-third the energy of standard dealership outdoor lighting without distorting vehicle colors. The company considered installing solar panels, but decided against it because sunlight glinting off the panels might distract pilots on final approach to the airport, Lai said. And DCH has installed two plug-in chargers for electric vehicles. The total tab ran $6.5 million, and the company pays the city $40,000 per month to lease the land. Meanwhile, the former Torrance showroom will be transformed into a large service-only location at a cost of an additional $6.5 million. DCH also has organized the dealership to better manage customer flow. There are plenty of emergency exits, but only one main showroom entrance -- and it is staffed by greeters to help direct customers. Then there is a dedicated, shaded delivery area that uses special spotlights to make the customer's new car "pop" when he takes the keys from the salesperson. In 2011, Toyota of Torrance sold about 140 new and 50 used vehicles a month. This year, sales are running at 270 new and 80 used, thanks to increasing inventory and a rebounding local market. Lai hopes the new dealership eventually will sell 400 new and 150 used vehicles a month. "This is a big market here in Toyota's back yard," he said. "We don't have to kill each other to get business." At South Bay Toyota, a few miles up the road on Western Avenue, the Wilson group hopes to complete an exterior design that meets Toyota's Image USA II guidelines by year end. "It's a good operation," Whetter said. "It has great CSI, wins president's awards, has good processes, great people." The Wilson group bought South Bay Toyota, as well as nearby South Coast Toyota, from dealer Shigeyasu Hiraiwa in 2001 when Haraiwa and his managers were being investigated by the California attorney general for unscrupulous sales tactics. "The DMV was ready to shut it down due to its business practices," Whetter said. By the time South Bay Toyota was back in the good graces of regulators, the recession hit. "Even though we're across the street from Toyota, they have been very lenient about the economic situation," Whetter said. "We're still digging out from a dicey recession." The interior has been modernized in the interim, but the exterior still looks dated. The improvements can't come soon enough. The Wilson group knows how to do an Image USA II project, having recently established nearby Taj Mahal stores in Orange, Riverside and Huntington Beach. But it's expensive. The company has bought out and knocked down an adjacent machine shop and gas station. The total cost so far for land and buildings is $10 million. To get the exterior to Image USA II standards likely will cost another $3 million. "That's a rent factor of $130,000 a month," Whetter said. "You have to sell a lot of cars to do that." He expects South Bay Toyota to sell 2,400 new and 1,000 used vehicles this year. Once the new design is in place, he is confident that number will rise. Wilson has a meeting this month to set the construction timeline, at which point things figure to move pretty quickly. Toyota of Orange took just six months to complete from a similar starting point. "We have five blocks of property," Whetter said. "We own the property. The inside is all done. From an interior perspective Toyota is very happy. The final blow is the Image II fascia. We're in full-blown planning mode to complete everything."